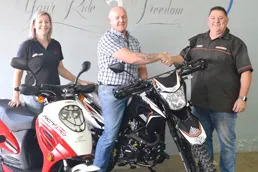 SAM is a proudly South African company, focused on providing a wide range of scooters, commuters, on and off road motorcycles, ATVs and commercial and utility vehicles at unparalleled value-for-money. SAM was born into the scooter market, providing an affordable and entertaining mode of transport at a super-low cost. The market exploded and over two decades later, SAM’s range now boasts over 40 different mixed-use models and encompasses South Africa's most popular value-for-money brands including Big Boy, GoMoto, Jonway and Bajaj, all sourced from our trusted line-up of overseas manufacturers. What are the advantages of SAM compared to other brands? Where can I see one of the models sold by SAM? Can your bikes be financed? Why do I have to buy through an authorised SAM Dealer? What type of warranty do your products have? How does your Finance, Insurance and work? Where do I bring my ride for repair? What if SAM does not have the spares I require in stock? Do I need a licence to buy a road-legal model and to ride it on the road? Congratulations to the winner of SAM's Big Boy TSR250 Competition, Mr. Russell Harvey from Durban. Russell had purchased a RCT170 for his son and now has a FREE TSR in his garage. SA Motorcycles wish them both many miles of safe and enjoyable riding together. Pictured below: the prize handover at the winning dealer Jonway KZN in Durban are prize winner Mr. Harvey with Andre and Wilna Pelser, owners of Jonway KZN. The 'I Do Africa Adventure'- Big Boy’s Greatest Adventure Trip to date. In 2012, Big Boy South Africa got together with two brave young newlyweds who decided to tour Africa on a motorcycle for their honeymoon. Click the pic to watch the video of the incredible ‘I Do Africa Adventure’ which took them from South Africa all the way to Egypt, TWO-UP on a 150cc Big Boy. SAM- for specialised Commercial, Fleet and Utility Solutions. The ever-expanding range of SAM’s commercial and utility 2, 3 and 4-wheeled models brings a new level of efficiency and affordability to a host of applications. View our current Commercial section and contact Dirk on 011 794 6399 or e-mail: dirk@jonway.co.za for a tailor-made solution for your business. SAM, now SA's best-selling motorcycle & ATV brand up to 250cc. SAM's focus on the 'affordable' motorcycle and ATV market has put us in the lead in the category of motorcycles and ATVs up to 250cc. The Big Boy, GoMoto, Jonway and Bajaj range all offer unbeatable value across the range. Visit a dealer today and see for yourself. Click on the image above to locate a dealer. South African Motorcycles, on a motorcycling mission to provide the best range, best service and best price nationwide- we’re the brand that gives you 'More Ride for your Rand'.